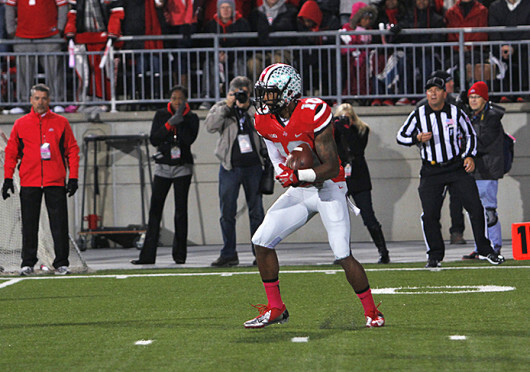 Senior wide receiver Corey “Philly” Brown (10) fields a punt during a game against Penn State Oct. 26 at Ohio Stadium. OSU won, 63-14. The Ohio State football team looks to reverse the script from its recent shortcomings in West Lafayette, Ind., this weekend when it faces off against Purdue. The Buckeyes have recorded just one win their last four trips to Ross-Ade Stadium. OSU senior wide receiver Corey “Philly” Brown said the Buckeyes held a meeting, organized by coach Urban Meyer, Wednesday to address avoiding another hiccup. Meyer said Purdue (1-6, 0-3) is a better team than its record indicates. Meyer said his staff has had some difficulties preparing for Purdue because for the last two games, the Boilermakers have run a 3-4 defense instead of the 4-3 they began the season with. The Boilermakers are coming off a 14-0 loss at Michigan State Oct. 19. Coming off its largest Big Ten victory this season, a 63-14 home defeat of Penn State, OSU is again looking to impress voters. Currently, the Buckeyes rank fourth in the BCS standings and need some help if they hope to make it to the title game. “We set the bar pretty high with (last week), and now from here on out it should be nothing less than that every game,” Brown said. Redshirt-junior cornerback Bradley Roby, whose play has been criticized this season, said he finally has the mental side of his game on track. Brown said being in the hunt for a national championship has driven his squad to a new level. The Buckeyes (8-0, 4-0) and Boilermakers are set for a noon kickoff Saturday in West Lafayette, Ind.